You're chatting on the way out of an office building. You come to a door. It's locked. 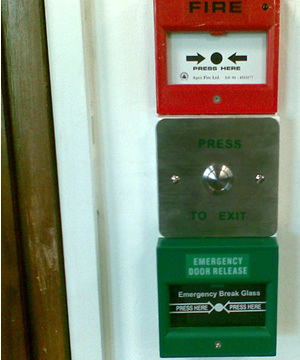 Someone shouts over that you need to "press the button" to open it. To your right 3 boxes are lined up on the wall, coloured kinda like traffic lights. You don't stop to read them. You just make a snap decision and stab a button. Well, many people press the big green box. Why? Because it is big and green. And green means "Go"! Unfortunately, this means the maintenance man has to repair the emergency door release button every few weeks.